Our look back at the 1985-86 season continues with the Boxing Day fixture at home to Manchester United. That seasons title race was the tightest for sometime (probably until this season), with eight or nine teams in contention for much of the campaign. Everton had endured a difficult start to the season but were powering their way back into the race with a terrific run of form. Everton achieved one of their best, and certainly most important results of the season, beating league leaders Manchester United 3-1 at Goodison Park on Boxing Day. Two goals from Graeme Sharp and a typical Gary Lineker strike sealed a vital win for the champions who are now within five points of Man Utd. With the leaders not playing now until New Years Day Everton have a fantastic opportunity to close the gap further when they face Sheffield Wednesday at Goodison Park on Saturday. The two other clubs in the top three, Liverpool and West Ham also lost today, to Man City and Tottenham respectively to make this a perfect late Christmas present for The Blues. 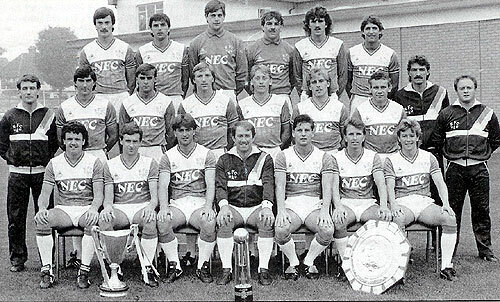 Everton XI: Southall, Stevens, Pointon, Ratcliffe, Van Den Hauwe, Heath, Steven, Lineker, Sharp, Bracewell, Sheedy. Below is an extract from the Daily Express match report published on Friday 27th December 1985. Everton came galloping upon the rails yesterday as the front runners in the First Division all failed to clear the holiday hurdle. League champions Everton beat Manchester United 3-1 before a 42,551 Goodison Park crowd to broaden soccer’s premier competition into a nine-horse title race. With Liverpool and West Ham both losing away matches and Chelsea’s game against QPR washed out, Howard Kendall’s Everton team came strongly into contention. It means the League championship, which Manchester United threatened to win at a canter, is now promising to develop into one of the most intriguing contests for years, with only seven points separating the top six clubs.